I’m once again traveling light. That means no proffesional camera. I have my Laptop, iPad, two iPhones, all the cables to keep things charged, battery backup and some overnight stuff. It’s certainly a weird feeling but I have gotten use to the limitations of photographing with a mobile phone and find the iPhone 4s more than adaqate for swift image grabs of the world around me as I record audio with Audioboo and create other web based media uploading as I go. As the Foreign and Commonwealth Office have a team of snappers doing their thing i felt i’d shoot straight and convert the images to B&W. I am using the normal iPhone 4s camera app and opening the images in Pixlr-o-matic. This means that I still have all the images in standard format on the phone. It is a little time consuming as it’s not the fastest working app but I am saving at the largest resolution allowed. If you keep the images styled the same across the day it doesn’t look too shody. 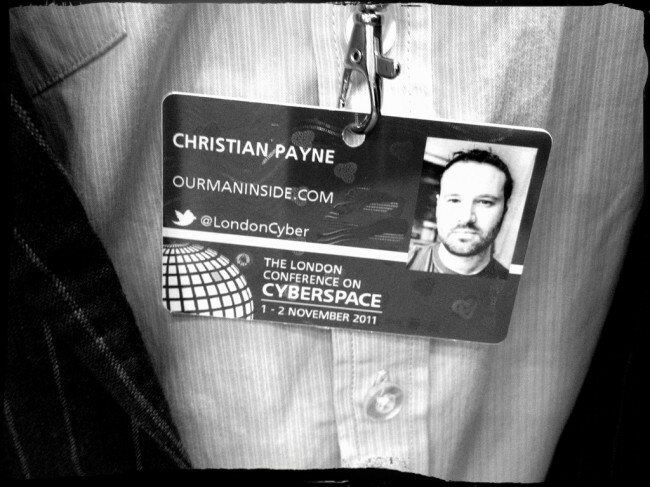 I have another day at The London Conference on Cyberspace so there will no doubt be more images and audio coming out. I have started a Storify containing some of my postings and will continue to post things there. Thanks to @VodafoneUK for the loan of the phone and the Foreign and Commonwealth Office for inviting me to be a part of the conference. Interesting stuff from you again Christian, it’s like being there. Keep up the good work. I’ve reposted the #LondonCyber iphone 4s photos with a flickr gallery as the posterous gallery was buggy..